Order Entry & Invoicing | Western Canadian Software Inc. 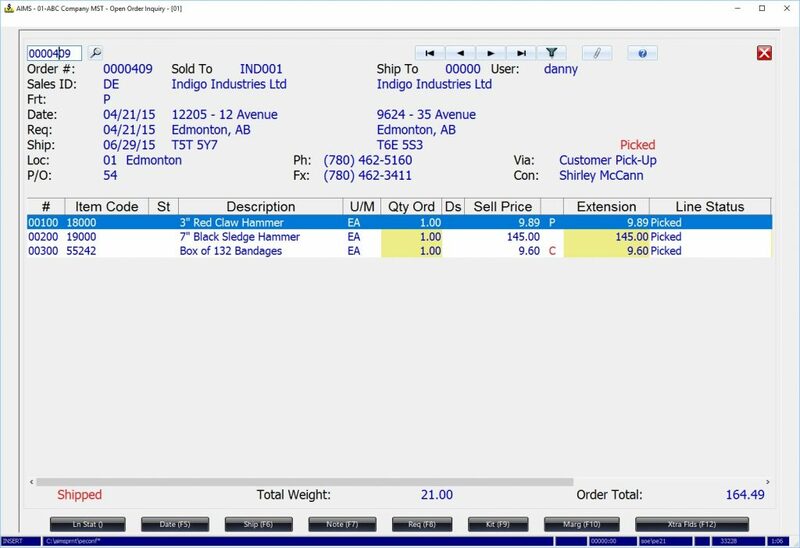 Lets you enter sales orders quickly and efficiently, print pick slips, and send order confirmations. Accommodates multiple pricing structures to automatically price orders. Facilitates purchase requisitions (for non-stock items) and manufacturing requisitions (for manufacture to order). Provides for selling kits and serialized items, charging core charges, collecting customer deposits, denoting discontinued items, and managing consignment inventory. Includes an excellent system to manage customer credit. Handles back orders and cash sales. Enables shippers to enter shipping information, select carriers, print packing slips, print labels, and make bills of lading. Gives useful inquiries and reports. Users enter and edit sales orders, which commit stock until orders are invoiced. If the order takes the customer over their credit limit or if their account is over 60 or 90 days, the system puts the order on ‘credit hold.’ Available inventory for each ordered item is displayed along with whether the item is a kit, an assembly, has substitutes, is discontinued, or is a non-stock. Kits and assemblies can be customized (modified) during order entry. Kit components can be included on the pick slip or printed separately. Both kits and assemblies can have purchase requisitions attached to them. Back orders are created automatically, when invoices are posted, and there’s an Order Fill Report to manage them. You can access the Cash Sales screen directly from the Order Entry screen, adding customer records on the fly. Cash Sales works with bar-coding devices, cash drawers, and small invoice receipt printers. You can enter invoices directly into the system or generate them from a sales order. You can add items to an invoice that were not part of the original order. Numerous searches are available. The system calculates all taxes and prints invoices and credit memos either individually or in a batch. You can also enter manual sales (i.e., invoices not created by the system). This module integrates with Quotations, Sales Analysis, Inventory Control, Manufacturing, Accounts Receivable, and General Ledger.